Today Apple announced AirPort Express, a product that manages in true Apple fashion to be about a half-dozen ideas rolled together into one small white plastic box. Looking weirdly like an Apple power brick (it measures less than 4-by-3-by 1 inches, and weighs less than 7 ounces) , the $129 AirPort Express is an AirPort Base Station, a wireless relay, a wireless bridge, a music streamer for stereos and powered speakers, a wireless print server, and an answer to the prayers of PowerBook-toting business travelers. Let's start with the basics. Due to arrive in users' hands in July, the AirPort Express is an AirPort Base Station that fits in the palm of your hand. It doesn't offer all the niceties of the UFO-shaped AirPort models, such as support for up to 50 users, separate LAN and WAN ports, an external antenna connector, or a built-in modem. This means that Apple has finally released an AirPort Extreme base station that's more reasonably priced for casual home users. But I suspect AirPort Express will really shine as an additional wireless product. 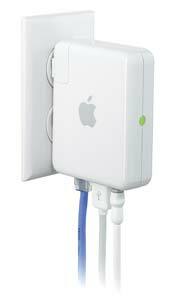 For example, you can use it as a relay point in concert with an AirPort Extreme Base Station to extend the range of your wireless network and help you bring Internet connectivity to dead spots in your home, office, or school. For business travelers who've gotten used to working wirelessly, being tethered to a short (and often inconveniently placed) network cable in a hotel room can be infuriating. But I imagine a whole bunch of those road warriors will soon be including an AirPort Express in their travel kit; once you get to the hotel, we'll plug an AirPort Express into the wall and the broadband cable. From there on out, we'll be able to surf wirelessly from the desk, the bed, the couch, heck, even the bathroom sink! AirPort Express also has a USB port and the same USB printer-sharing features as its AirPort Extreme cousins. So if you've got a shared printer in your family, office, or classroom, you can place it in a central location and attach it to an AirPort Express, making it available to everyone on your network. If you're using AirPort Express as a base station, you'd plug your Internet connection into it via its included Ethernet port. But if your main base station is an AirPort Extreme or AirPort Express, you can also use the AirPort Express as a wireless bridge -- just plug it in somewhere else in your house, and attach any Ethernet-based device to it. That device will now be on your network, even though it's nowhere near the rest of your stuff. So, sounds great, right? A $129 mini AirPort Base Station. What else could you ask for? It's got an audio-out jack on it. It's encouraging to see Apple embracing digital music in places away from the Mac or the iPod. Of course, you must still use have iTunes open and running on a computer in order to play music to AirPort Express... but a lot of iTunes users want exactly what AirPort Express will give them: an easy way to play their tunes through their home stereo, or to a small set of speakers on the back porch, or into a child's bedroom. With its simplicity and iTunes integration, I suspect that AirPort Express will be a big hit. I can't wait to get my hands on one.